We were excited when we first heard rumours on the streets of Copenhagen about a new bike brand in Frederiksborg Street. The name alone was cool and fresh - Larry vs Harry. 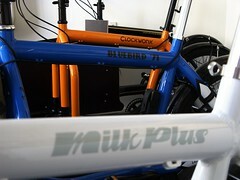 What kind of bikes would a company with such a funkalicious name make? We finally got around to paying them a visit and we're glad we did. Hans is the one half of the Larry vs Harry duo and he runs the shop and the sales end of the show. We chatted in their cool little shop and two things were evident right from the start. 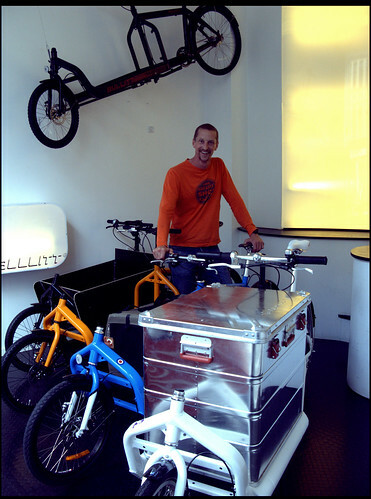 Firstly, the cargo bikes are a headturner. There was one outside the shop window and it was amazing to see how many people stopped to stare. Secondly, from the inside the view is amazing. It's the busiest stretch of bike lane in the nation with upwards of 30,000 cyclists a day passing by. Must be hard to concentrate, as it is one long parade of Copenhagen Cycle Chic. Then there are the bikes, which is what it is all about. It is so refreshing to see new design thinking, especially regarding cargo bikes. Like so much of the Danish design tradition, it is the simplicity of the concept that is brilliant. Larry vs Harry have revised the age-old Long John concept - two wheeling cargo joy. 80-odd years of the dependable, functional Long John and then these guys come along and give it a funked up modern twist. 'If it ain't broke, don't fix it' is so true but nobody ever said you couldn't spice it up, tweak it, love it a little bit more, give it more personality. And while you think of the Danish Long John when you see them, and other Long John style bikes out of Holland, you quickly realise that you're looking at something completely new and fresh and different. 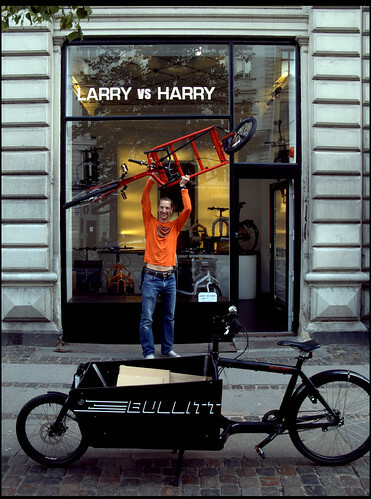 The bikes of Larry vs Harry are for a whole new generation. They are for carrying Copenhagen cargo but they are geared at a crowd who fancy a bit more speed and a lot more style. No comfy saddles here, just thin racing ones and from the positioning of the handlebars on the models in the shop you can see that they suggest you lean into that headwind. Likenesses of Burt Reynolds, Ringo Starr and Elvis were spotted on frames elsewhere in the shop. "A pimp is only as good as his product." "You will not be able to stay home, brother!" We've never seen anything quite like it in the bike industry. Retrovelo, out of Germany, have a clear idea of what they do and how they do it, and Velorbis are very specific about their branding and marketing albeit for a different customer target group, but Larry vs Harry take it to a whole new level with their modern twist. Check out this film from Larry vs Harry to see the beast in action. Larry vs Harry are rolling up their sleeves and getting ready for Eurobike, the world's largest bike industry fair next month and are aiming to start a fantastic export adventure. With a little bit of a tailwind, they'll be coming soon to an America near you. In the meantime, Copenhagen bike culture just got a little bit cooler.